As hardware becomes more power efficient and compact, Steam Machines and other small form factor systems are slowly beginning to invade the living room. As a result, PC gamers have found themselves spending more time on the couch, and playing games on the TV. 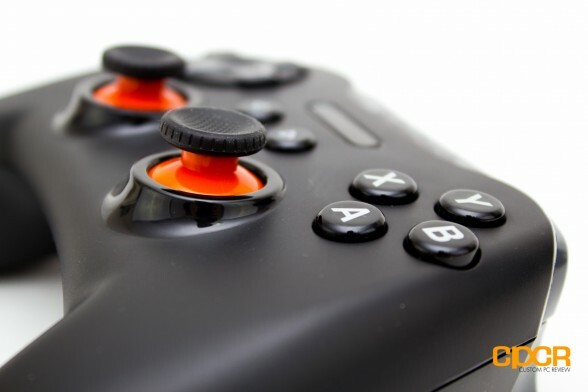 This transition to a more casual gaming environment has also sparked many peripheral makers to pursue the customized gaming controller market. Many of today’s hit titles such as Rocket League and Mortal Kombat X tend to fare much better with the controller. Awhile back we had posted about our E3 hands on experience with the Stratus XL, SteelSeries’ answer to the developing peripheral market. I was intrigued by its broad Xbox like shell and Playstation placed analog sticks, a combination I had wished would have been implemented on an official console controller. This time around I delve deeper to find out everything the Stratus XL promises and we will found out if this controller will live up to its hefty $59.99 MSRP price tag. 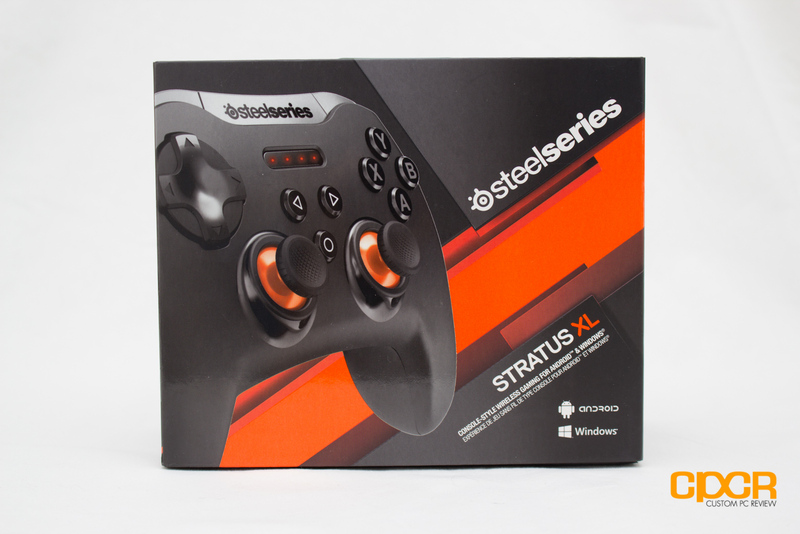 Here’s a look at the packaging for the SteelSeries Stratus XL. Packaging is pretty straightforward with the only accessories being a set of AA batteries and some documentation. Here’s a first look at the SteelSeries Stratus XL. The external shell resembles that of the Xbox controller, hence why it felt familiarly comfortable as soon as I picked it up for the first time. 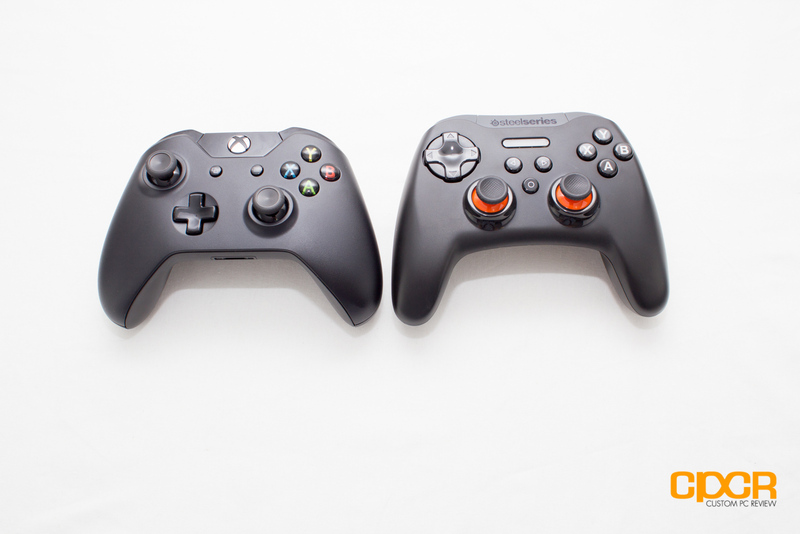 Placed side by side the similarities are obvious apart from the symmetrical joysticks on the Stratus XL. Taking a look at the rear of the controller reveals some interesting design choices. 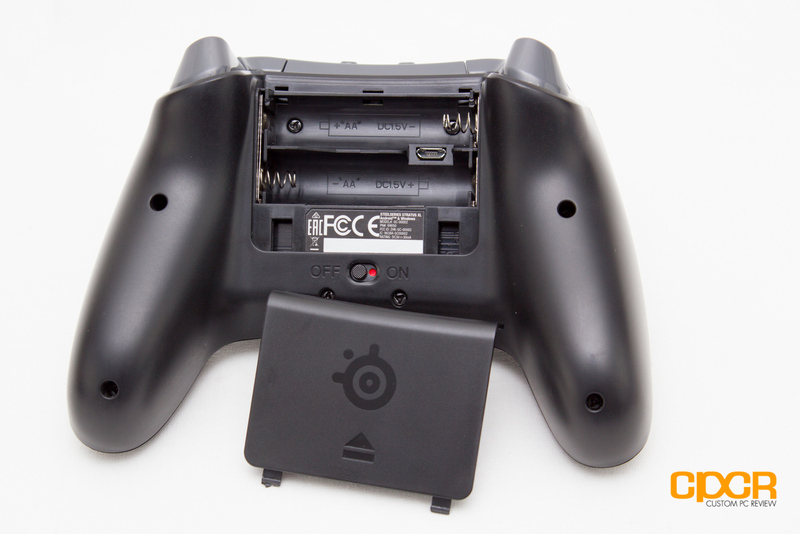 First, the controller runs on two AA batteries which provides close to the 40 hour of use SteelSeries advertises. 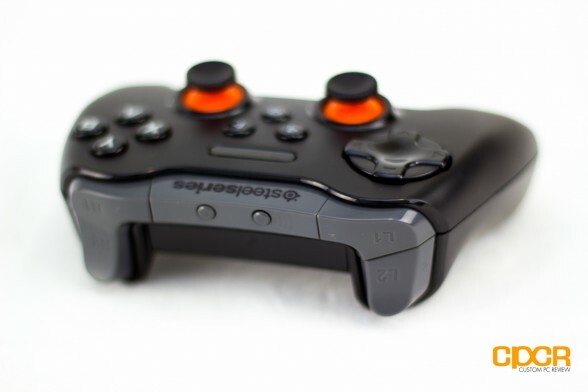 Second, I was initially very happy to discover a micro USB port on the controller as during my interview with SteelSeries at E3 they had said it was purely wireless system. Unfortunately, plugging in the Stratus XL into my computer yielded no response apart from some lights showing up on the controller. Speaking with the SteelSeries representative, I learned that the port is only for updating firmware and they did not make it possible to used wired. Bummer. **Update: SteelSeries has changed the way the USB works. The latest SteelSeries Engine now supports the controller for wired use. It’s still a very cluncky solution, but at least now you won’t be stuck with a useless controller when you’re missing bluetooth. I am happy to report that the stiff analog sticks on the Stratus XL for iOS was not present in the Windows and Android variant. Aesthetically, the eye catching glossy-orange base and stem of the analog sticks looks very sharp. Located on the top of the controller are two small buttons to show battery life and sync Bluetooth with either a PC or android device. On the sides are the triggers, which appear to be cheaply constructed from the same glossy grey plastic used on the rest of the top side. In terms durability of the this part, I have little to complain about given the fact that it has lasted throughout several road trips and vacations but I wished for this premium price tag the material choice could have been improved. 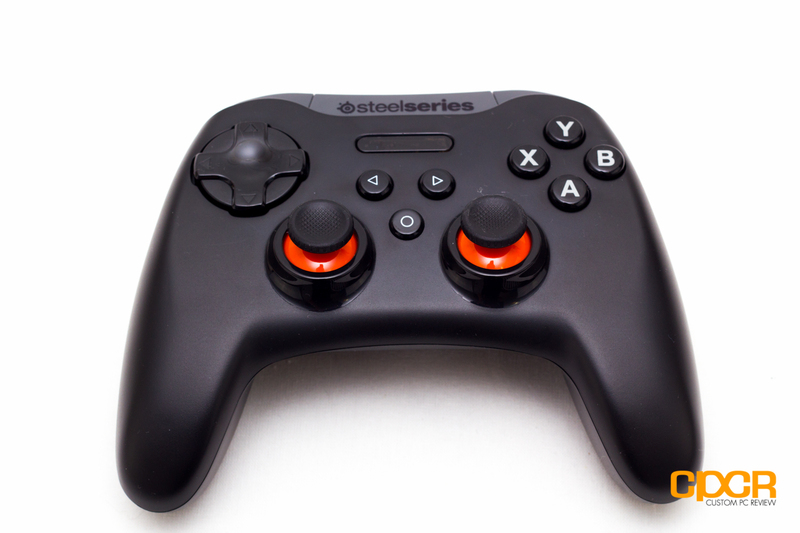 Using the SteelSeries Stratus XL with Android devices is as simple as using any other Bluetooth accessory – simply enable Bluetooth on the device and hold the Bluetooth button on the top of the Stratus XL. The Stratus XL will show up as a nearby device in the Android settings and selecting it to pair up concludes the trouble. The majority of the controller enabled games on the Google Play store will already have pre-mapped controls so you can use it right away. In the case you want to have more customization, that will be depend on the game itself. This is rather inconvenient at times, but unfortunately there aren’t any workarounds as of the writing of this review. That being said, the SteelSeries Stratus XL also works on the PC and the lack of customization on Android is not applicable on the significantly more mature Windows platform as SteelSeries’ Engine 3 software brings out the full capabilities of the controller. For anyone familiar with other SteelSeries peripheral the SteelSeries Engine 3 for the Stratus XL is not particularly different. Clean aesthetics and ease of use are two things that immediately come to mind when booting it up. Deadzones and sensitivity (for both X and Y axis) can be set of individual joysticks to accommodate for even the most nit picky of gamers who demand the most refined aiming customization. If the precision joystick control is not enough to satiate your gaming needs, the Stratus XL goes the extra mile with modifiable individual trigger deadzones. I hopped straight into the Super Smash Bros inspired fighting game Rivals of Aether to test how the Stratus XL would hold up to some intense button mashing. Since the Stratus XL had an identical shape as my beloved Xbox controller, it felt incredible in my hands during my fighting game testing. The eight directional D-pad was responsive and did not feel mushy. Furthermore, feedback from the colored buttons were more than satisfactory. As a result, the process of hitting combos in quick succession changed from frustrating to captivating as I excitedly waited for the opportunity to unleash my fury against unsuspecting opponents. For Android testing I had a bit more difficulty finding games that would have solid controls that would work with the Stratus XL. In the end I settled with Reaper, an action RPG sidescroller. The game mainly consists of timing dashes and jumps, which showcased the full benefits of the separate controller in comparison to touch screen controls. Ultimately, it was useful but I don’t think it is very reasonable to be spending $59.99 for just the purpose of a mobile gaming accessory. I would envision this to be a better option for Android based gaming devices that do not come with readily available controllers. 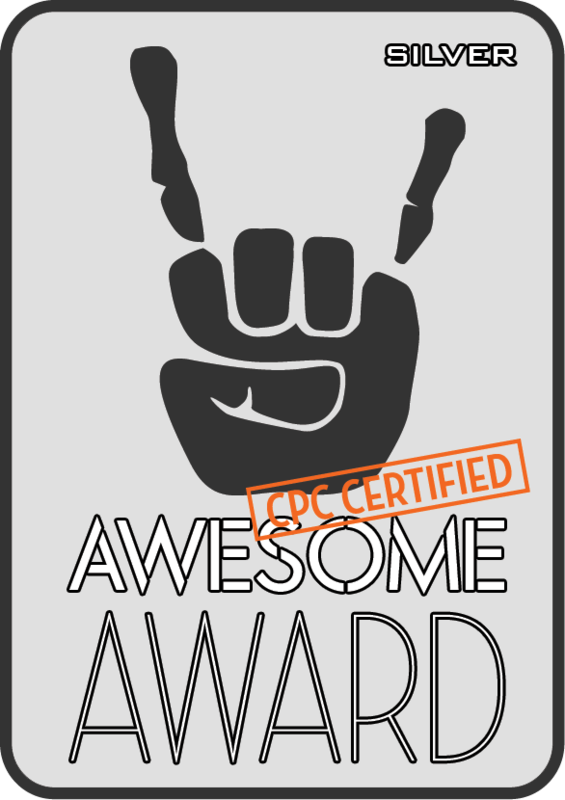 Note: I purposely avoided playing first person shooters with the controllers due to the fact that my preference for accuracy of the mouse and keyboard would most likely cause my opinion to be negatively biased. The construction of the SteelSeries Stratus XL is robust for the most part and its ergonomics contours are on par with other controllers in this price range. Its medium sized shell fits snugly in my hands and its matte plastic finish minimizes fingerprints and grime buildup. 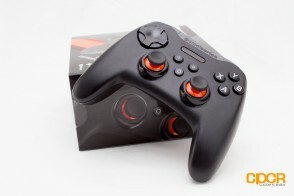 The quality and performance of the D-pad, joysticks, buttons and triggers at the very least met my expectations. 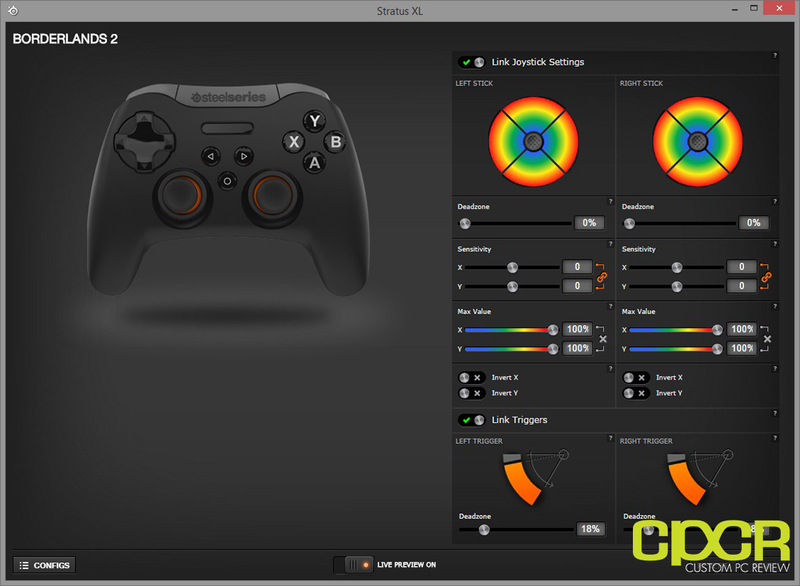 One of the huge perks with the SteelSeries Stratus XL is the SteelSeries Engine software utility. It offered me overwhelming freedom in customization. For the first time I was able to tune the controller exactly how I liked it and after two months of using it, I may have a lot of trouble getting used to any other controller. Nevertheless, the Stratus XL has its flaws. 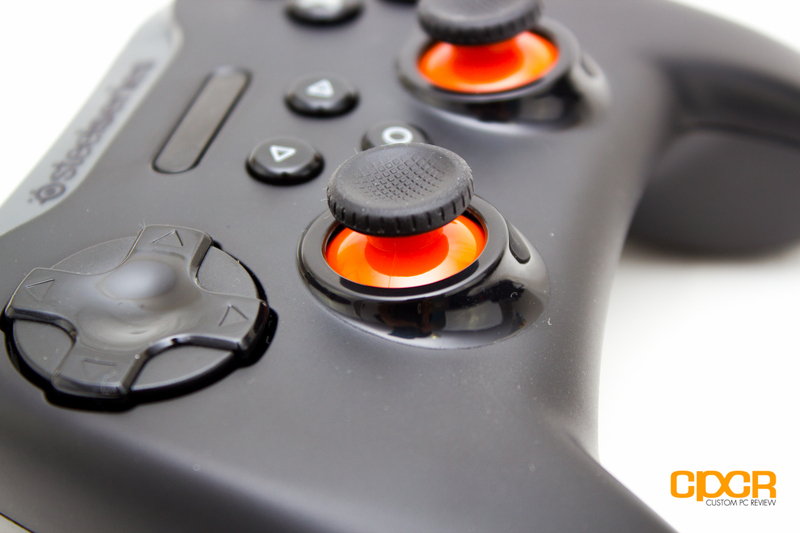 The concave top of the joysticks just doesn’t feel as nice as the joysticks on the Xbox One and PS4 controller. I understand that it’s meant to hug my fingertips, but my fingers were resting on the edges more so than sitting in the center. While I didn’t experience any durability issues with its triggers and bumpers on my road trips, given its premium price tag I would have expected a better grade of plastic to be used. Lastly, the bumpers are too mushy for my taste. I prefer the tactile feedback of the bumpers on my Xbox One controller. 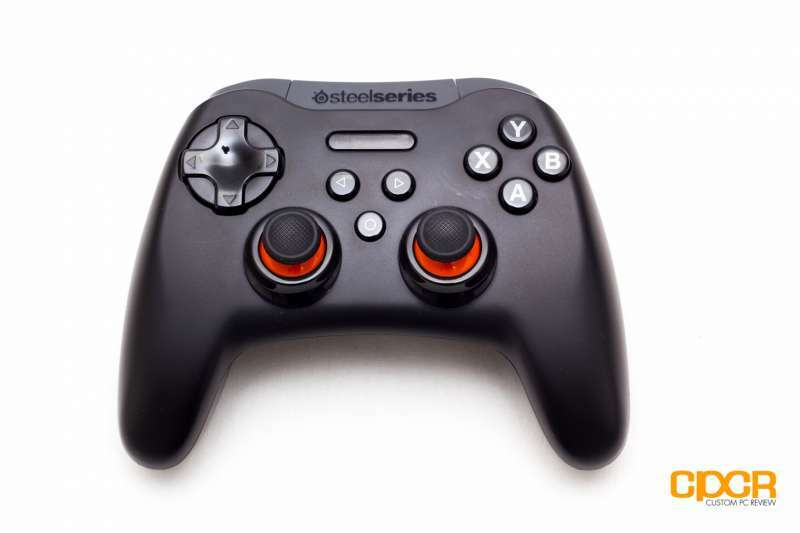 The SteelSeries Stratus XL for Android and Windows is priced at MSRP $59.99, placing it direct competition with the Xbox One Controller and the Razer Sabertooth. At the time of writing, the SteelSeries Stratus XL is a good option for gamers looking for a massively customizable controller at a mid-range price point. That said, if you are looking for something that packs more robust hardware, I would suggest looking elsewhere as its materials are relatively average for the price. Ultimately, the Stratus XL is a decent controller that sits in the niche of gamers looking for a controller compatible with both Android and Windows gaming. 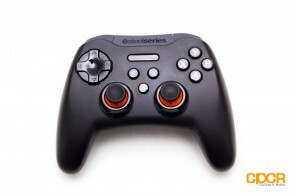 Hey, I have this controller, and contacted steel series about the wired controller support after purchasing the item due to the update status on the article. Can you please explain the “clunky” solution for a guy with not a lot of $ in his wallet and no Bluetooth on his Windows laptop? :) it would make my year! The standard wired Xbox 360 controller should do the trick if you are on a budget. Personally I am using a spare ps3 controller running on some third party driver software but it is not the most consistent thing and setup is a hassle. Thanks Alex for writing back. Steel series…… it sort of made me upset, but after contacting customer support, they suggesting i purchase a bluetooth 4.0 adapter for $18 or so from amazon. He also said this in case anyone was in my situation. I apologize for the update, the steelseries engine recognizes the controller when plugged in via micro usb but doesn’t actually offer any in game use for some odd reason.